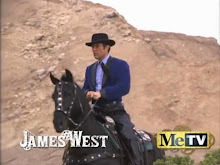 Here is a video on Lasker-Bauer, Amsterdam 1889 which featured a double bishop sacrifice. There seems to be an error: Bauer is said to have resigned on his 22nd move, but this actually happened on move 38. 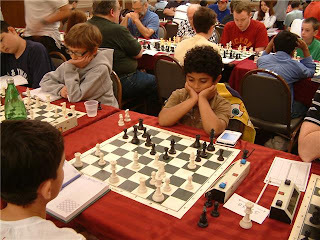 NM Rohan Agarwal, age 15, of California likes to play the Philidor Counter Gambit. 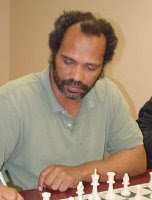 In this game, IM Emory Tate [pictured above] avoids the main lines with the unusual 3.c4, all to no avail as Black wins in 29 moves. 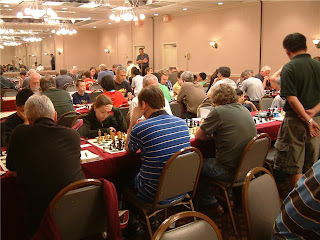 The USCF ratings shown are post-tournament. 24.g4 Qf4 25.Ne4 Bxf2 26.Rh1 Rg6 27.Kh3 h5 28.Qe2 Rxg4 29.Qxf2 Qxf2, White resigns. 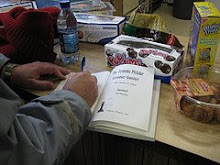 Tomorrow May 30th, from 12 noon to 6pm, the Marshall Chess Club will conduct a sale of thousands of books, periodicals, and tournament bulletins, as well as opening and endgame collections. 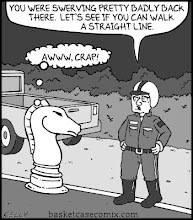 All proceeds will go to the Marshall Chess Foundation. The book fair is open to the public. Stop by and browse! Former world champion Emanuel Lasker made famous the double bishop sacrifice in the middlegame, as part of a mating attack. Above is the position in Lasker-Bauer, Amsterdam 1889 after Black's 13th move. Lasker uncorked 14.Nh5 Nxh5 15.Bxh7+! Kxh7 16.Qxh5+ Kg8 17.Bxg7! Kxg7 18.Qg4+ Kh7 19.Rf3 e5 20.Rh3+ Qh6 21.Rxh6+ Kxh6 22.Qd7 Bf6 23.Qxb7, winning easily. It is not often that a double bishop sac occurs in the endgame. 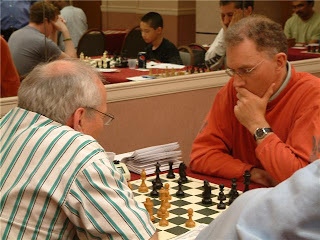 This position was reached after 43.Rf2 in my game as Black against NM Mark Kernighan, at the Hamilton quads in May 2009. Play continued 43...Bf5+ 44.Kd5 Bc8 45.Ke4 Bb7+ 46.Kd3 Kf5 47.Ra2 Be4+ 48.Kc4, arriving at this diagram. Having chased White's king away from the queening squares, I now embarked upon a winning double bishop sacrifice with 48...Bxg2! 49.Rxg2 f3 50.Rc2 Bxh2! 51.Rxh2 g3. With his king far away, White's rook cannot stop the double connected passed pawns on the sixth rank. One of them must queen, leading to a won queen vs.rook ending for Black. The game concluded abruptly after 52.Rh8 g2 53.Kd3 (53.Rg8 Ke4) g1=Q 54.Rf8+ Ke5 55.Rxf3 Qd1+ 56.Ke3 Qe1+ 57.Kd3 Qe4+ when White resigned. 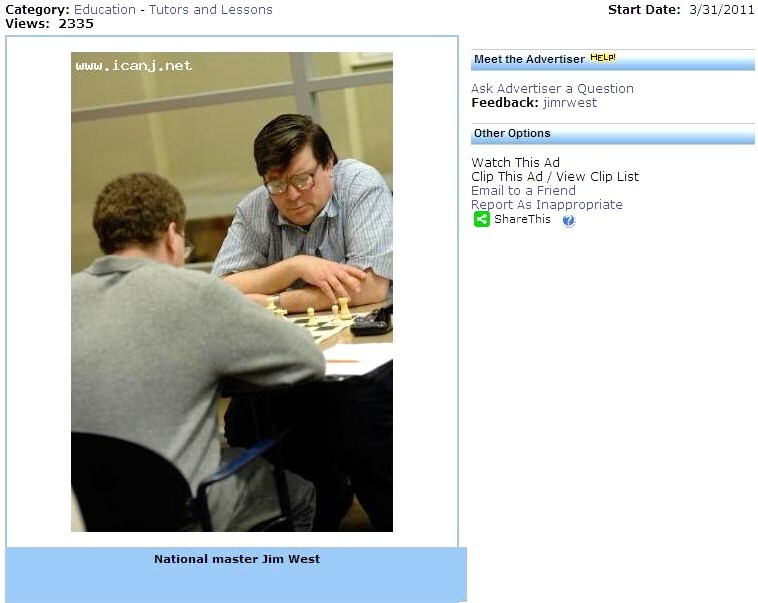 Steve Ferrero, who edits Atlantic Chess News, has e-mailed these photos and captions of the U.S. 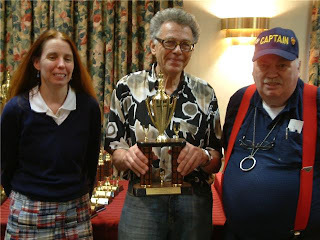 Amateur Championship East, which ended on Monday in Somerset NJ. 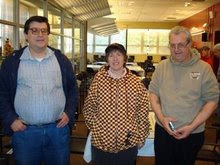 The prize winners are flanked by assistant TD Noreen Davisson and TD Ken Thomas. From the Under 2200 section, Sandi Hutama was on a hot streak and proved unstoppable, very deservedly grabbing first place. From the Under 2200 section, Sameer Mujumdar turned in a solid performance to win second place. 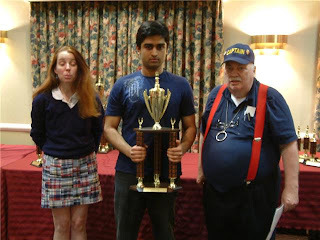 From the Under 2200 section, Satyajit Malugu earned the third place trophy. From the Under 1800 section, Samuil Chatsky proudly displays his prize, as he managed to win the Top Senior trophy. 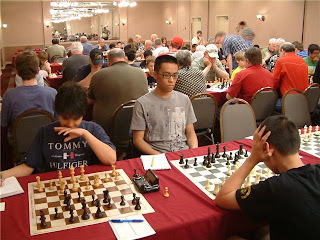 In the Under 2200 section, we have Timothy Hall (left) during the middle stages of play against Kevin Chen in round 4. 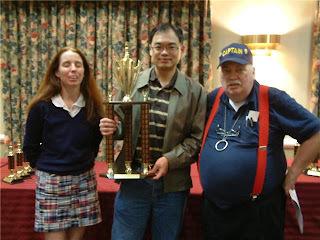 Kevin eventually reeled in his higher rated opponent in a grueling 87 move marathon game, involving a queen + 2 pawns vs. queen ending, which went on until nearly 11pm before Kevin was able to sidestep the numerous checks and convert the point. 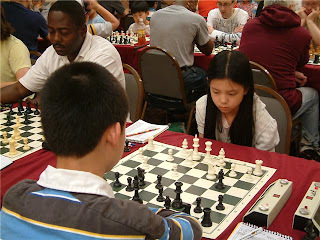 In the Under 2200 section, we have Andrew Ding (back to camera) with the black pieces against Alice Dong in round four. 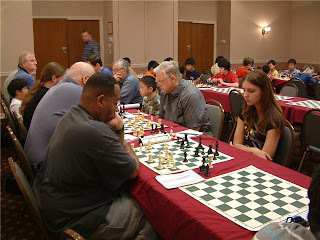 In the Under 2200 section, from round four, we have Leonard Chipkin (left) facing off against Anna Matlin, while Sameer Mujumdar (top) plays the black pieces. In the Under 2200 section, I caught this nice shot of the top boards at the start of round five. We have Satyajit Malugu (top left) who went on to win a very close game against Euclides Zoto (top right). Meanwhile, the cheerful Alena Kats (bottom left) eventually fell to Sandi Hutama. 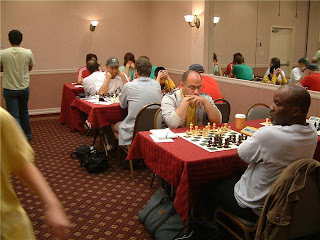 In the Under 2200 section, Lev Zilbermintz (foreground right) succumbed to a fierce White attack in round five. 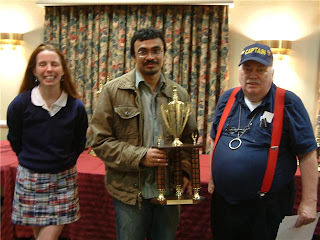 Sameer Mujumdar (shown with outstretched hand) tore through the competition to win second place. 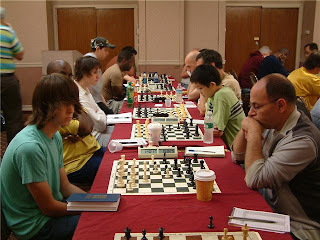 In the Under 2200 section, from round five, once again we have Leonard Chipkin (foreground right) with the black pieces against Jacob Kelly, while all of the games get underway. 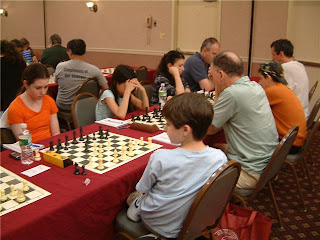 In the Under 1800 section, from round five, I am able to confirm that it is Samuil Chatsky (foreground right) penciling his move, as he plays Black against William Campion. In the Under 1800 section, from round five, there is no mistaking the affable Aravind Kumar (top right) playing the black pieces. 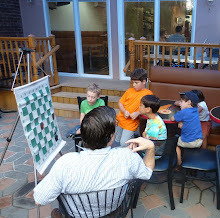 During the New York May Open, this past weekend, I took these pictures at the Marshall Chess Club. International master Jay Bonin arrives on Saturday morning. 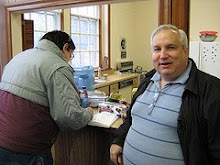 Tournament director Steve Immitt takes entry fees. My first round opponent Frank Paciulli prepares for our game. 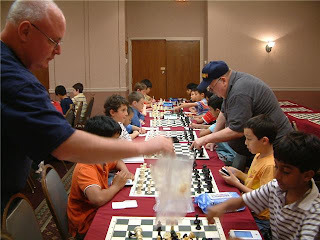 Although it ended in a draw, both players missed wins. IM Justin Sarkar arranges his pieces. 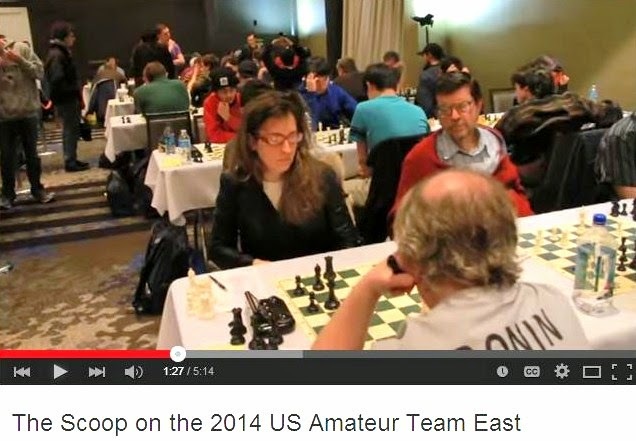 IM Jay Bonin and NM Iryna Zenyuk analyze their second round game which was drawn. 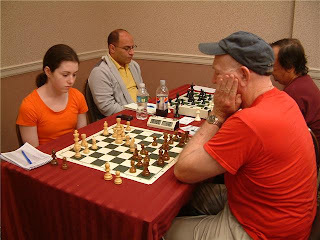 Ed Kopiecki, wearing the green shirt, plays Lilia Poteat in round two. Kopiecki won the Under 2000 section with a perfect score of 4 points. Here is more play from round two, in the one day schedule. 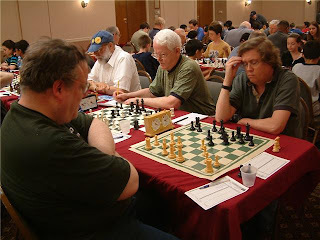 Two international masters, Jay Bonin and Alex Lenderman, relax before their final round game. 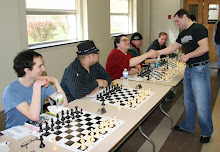 Bonin won it, enabling him to tie for first place with GM Leonid Yudasin and IM Oliver Barbosa at 3.5 points. 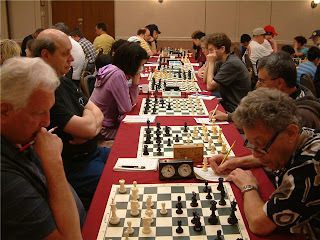 On Saturday and Sunday, I played in the FIDE rated New York May Open at the Marshall Chess Club where I drew all four of my contests. These are my games as White. 12.Bg3 Rfe8 13.Kh1 Rad8 14.f4 Nf8 15.Bh4 Be7 16.Qf3 N6h7 17.Bg3 f5 18.h3 Nf6 19.Bh4 Ne4 20.Bxe7 Qxe7, draw. 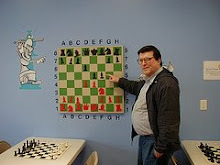 54.a6 bxa6 55.Rxa6 Re7 56.Re6 Rxe6 57.dxe6 Kd8 58.Kf5 Ke7 59.Rf4 Ra1 60.Rxg4 Ra5+ 61.Kf4 Kxe6 62.Rg8 Rc5 63.Re8+ Kf7 64.Rc8 Ke6 65.g4 Kd7 66.Rh8 Ke6 67.Rh7 Rc1 68.Rh5, draw. The U.S. Amateur Championship East is a three-day event that began yesterday at the Ramada Somerset. As a master, I am unable to play. 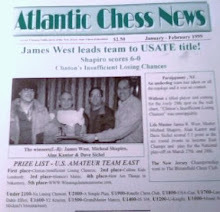 But Atlantic Chess News editor Steve Ferrero is participating and has e-mailed these photos. At the Munich Olympiad in 1936, Eggert Gilfer of Iceland lost this game in the Fajarowicz to Kurt Richter of Germany. 18.c5 Qg6+ 19.e4 Rab8 20.Qc4 Qf6 21.b3 Na5, White resigns.